Pakistan Peoples Party Leader Fauzia Wahab who is famous for her hard talks in Political programs has fell seriously ill and shifted to ICU in a private hospital of Karachi. Pakistan Peoples party spokesman has said that Fauzia Wahab was going through a minor surgery when she got seriously ill and shifted to ICU. PPP Leader is also put on the ventilator by the Doctors. 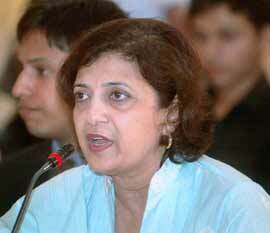 We will ask all the Pakistanis to pray for her health despite the political differences with Miss Fauzia Wahab.